It is a fortnight since I wrote [5 December 2017] about my enthusiasm at having bought a postcard of the old Youth Hostel on Birmingham Road, which was on sale on eBay as an unused vintage postcard dated October 1946. The postcard arrived in the post from Solihull this morning, and is now being framed and ready to be placed on a wall in the Rectory in Askeatron. My attention had been drawn to the photograph after a posting on Facebook and a conversation involving Susan Marie Ward and Kate Rodger. This was the first house I stayed in when I first visited Lichfield almost 50 years ago, when I was still in my teens. 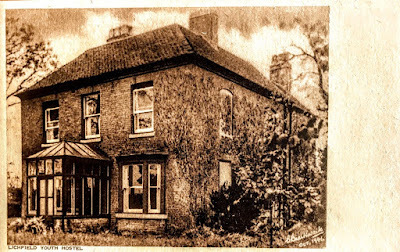 I was in search of the Comerford family connections with Comberford, between Lichfield and Tamworth, and I soon found that this house was a welcoming base for me for a few years. My initial posting two weeks ago has already had over 1,000 hits. Redlock House first stood at 128 Birmingham Road, Lichfield. When the houses were renumbered later, this became 116 Birmingham Road. It was a red-brick house on the west side of Birmingham Road, just south of the A461 roundabout and the railway overbridge. There may have been a number of YHA (Youth Hostel Association) hostels in Lichfield in the pre-war years, including two in buildings in Dam Street. Tt this hostel first opened in September 1943, bought partly with the help of a grant to the YHA Trust from the Ministry of Education on 28 February 1944. The hostel continued to open throughout the rest of World War II. After the war, a Carnegie Trust grant was awarded towards improvements at the hostel, and in 1964 an old stable was converted by volunteers into a modern dining room. However, industry started to develop in this part of Lichfield in the 1960s. Even though it was close to the open countryside of Staffordshire and twithin walking distance of the Roman site at Wall, the area became less attractive an area for youth hostellers. They were arriving in fewer numbers, and visitor numbers were in decline by the time I was staying here regularly. At one time, the warden was a Mrs Buckingham, so the hostel became known to many of its regular guests as Buckingham’s Palace. There was a Lichfield Youth Hostel badge showing the three spires of Lichfield Cathedral, but that is long gone, along with the rucksack it had become a part of and that disappeared in moves from Wexford to south Dublin later in the 1970s. I spent many regular visits to Lichfield here from 1970 until the hostel closed in 1973. It was from here I headed off to the Wenlock Edge in Shropshire, to Ilam on the borders of Staffordshire and Derbyshire, to the cathedral in Coventry, and to Stratford-on-Avon in Warwickshire to visit Shakespeare’s birthplace and the theatre. There were weekends with new-found but lasting friends in Lichfield, Brereton and Rugeley, and visits to houses and places once associated with the Comberford family in Tamworth and Wednesbury. In those years, I was training to be a chartered surveyor and studying at the College of Estate Management in Reading. But it was from this house I began contributing as a freelance journalist to the Lichfield Mercury, then based in Bird Street, the Rugeley Mercury and the Tamworth Herald. There were hitch-hiking trips that took me further to Oxford, London, and my first visit to Cambridge. But I always returned to this house in Lichfield, and it was while I was staying here as a 19-year-old that had a moving experience in the Chapel of Saint John’s Hospital in Lichfield that was life-changing and eventually, after many decades, led me on the path to ordination. Finally, due to declining use, the hostel closed on 12 October 1973. I continued to return to Lichfield regularly, and the Chapel of Saint John’s Hospital and Lichfield Cathedral became my spiritual homes. But from then on, I have stayed at a variety of addresses throughout Lichfield. Other people got in touch with me to say their parents had lived there, and that they had lived in the house as children. The property was finally sold in in 1987. It was later demolished and became part of the retail site that includes the Magnet premises. The remnants of the garden wall can still be seen in the grounds of Magnet and Southern. 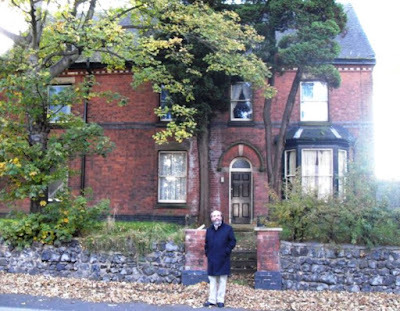 But some years ago, in a moment of nostalgia, not realising that Redlock House had been demolished, I went in search of the house that still has fond memories for me. But my memories played tricks on me, and I thought it was 108 Birmingham Road. I had myself photographed outside the house, and posted the image on Facebook. I now know I was mistaken. In my mind, I can still hear the trains passing by that house at night. It was a comforting sound, and I have happy memories. Now I’m looking for a place to hang this framed postcard, filled with warm memories. ** I Samuel 7:12 "stone of help" / "Yahweh helped us as far as this"
** Genesis 28: 10-22, Jacob's dream, and a stone 'pillow' became Jacob's 'place of remembrance' his 'Bethel' or "where God dwells". Your postcard and the place pictured holds fond memories and experiences for you. At other times in life, our "Bethels" rise from troubled/challenging periods. Yet in my dreams I'll be nearer, my God, to Thee. So by my woes to be nearer, my God to Thee...."
** Sarah Fuller Flower, born Harlow, Essex, England, 22 February, 1805; d. London, 14 August, 1848, age 43; a published poet and Shakespearian actress.